TextArt-Cool Text creator App is a wonderful text creator which allows you to create incredible texts. You can create effects, easily and quickly, and share it with your friends through your chat app like Twitter, WhatsApp, Line, Talk, WeChat, ChatON, Telegram, or any other chat application. You will certainly love it! 1: At the outset, enter the text to send. Use the [Edit Text] option – button or just double-click the preview area. 2: Now, select the preset/design that you love to use. 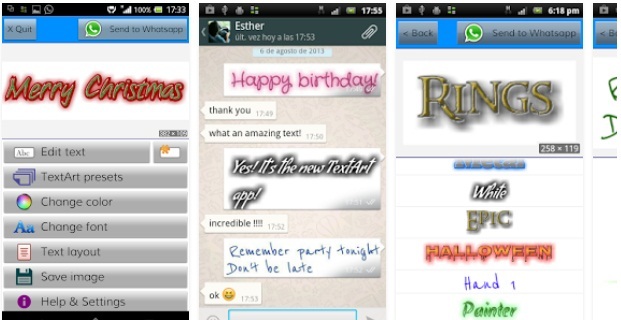 3: You can customize the design by changing the font. 4: You can even change the colour of the design. 6: You can use all the detailing. Download the app and enjoy the text writing techniques. You will enjoy every aspect of it.